Babolat has just released the official limited edition Wimbledon Racket and the cosmetics look really great – Our new launch price is £185.50 and it’s in store right now. This new look BABOLAT PURE STRIKE 16/19 not only looks good, but it feels good to play with too… lots of control and stability, and lots of speed. With a very stylish new paint job that will receive plenty of publicity as we get closer to the Championships, there’s the perfect excuse to revisit the Pure Strike range and give it a second look. A year on from the re-launch of the Strike Range, has it lived up to all the hype ? Definitely. You only have to read the endlessly positive customer reviews, particularly about the 16/19. People really seem to love it. We think it’s a bit more like marmite. You should try it out, if you haven’t before, but give it time to get used to all its point of difference. Its a cut down, clean racket – not cluttered with tons of technology – and therefore unique, compared to other Babolat rackets. This suits a lot of people, and has allowed it to sit comfortably between the dominant Pure Aero and Play ranges. 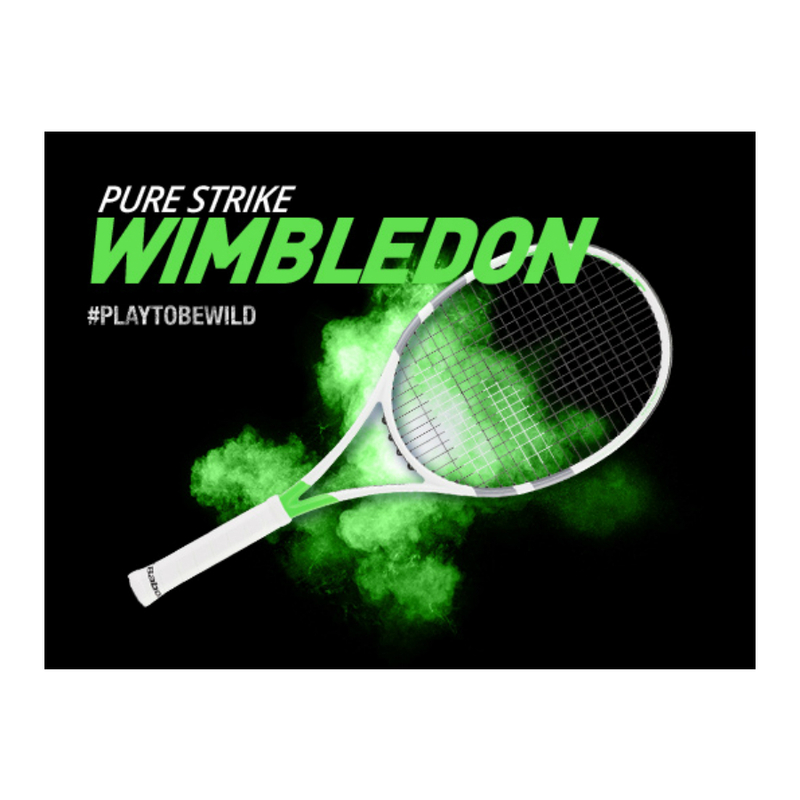 The Pure Strike range is endorsed by Dominic Thiem and this exclusive 16/19 racket will undoubtedly sell out long before the Championships begin. We think the colours this year are really strong and Babolat have done a great job as official licensees of this 2018 Grand Slam Tournamet. Interested ? At PURE RACKET SPORT we have a HITTING ROOM which can really help by letting customers have a hit with this and any number of similar performance rackets. Customers are keen to know whether the Pure Strike 16/19 compares well against the Wilson Blade 98, or the Yonex Ezone DR98 for example? Feel free to come in store to the Hitting Room, and try all three , one after the other………. Even better, is the Demo Service where you can take one home for a week to play matches and, as the Pure Strike feels quite different from the more dominant Aero and Play ranges, and its important to give it time to get used to a new feel, as it might just be better for your game.